Growing up in Switzerland – and the Swiss-German part no less – Bircher müesli was everywhere. In Switzerland, no hotel breakfast buffet is complete without this beloved breakfast food. Bircher müesli or simply Bircher as it is called in the French part of Switzerland where I have lived for the past 16 years, is a breakfast of oats soaked in milk, yoghurt, fruits, nuts and seeds. It is made in advance and kept in the fridge to be eaten over several days, making it a quick and convenient breakfast food. Bircher müesli was invented by a Swiss doctor called Maximilian Bircher-Benner as a way of helping the patients at his sanatorium in Zürich heal through the power of soaked cereal, fruits, and raw nuts and seeds. This might sound obvious to our modern ears, but was revolutionary at the end of the 19th century when meat, potatoes and white bread were the norm. And while the original Bircher müesli is a pretty good breakfast choice if you are able to digest milk and oats, I am not a fan of either and I know many people also find them hard to digest. Enter the Fruity Chia Bowl: Using a simple cashew milk instead of milk and chia seeds instead of oats, this breakfast is better than Bircher and might even keep you going for longer. Indeed, chia seeds were the food of choice for Aztec and Mayan warriors, who believed that a single tablespoon would keep them going for 24 hours. I am not sure I can guarantee 24 hours, but my husband and I both tried 5-6 hours between breakfast and lunch and it definitely kept us going! I wrote more about the wonder of chia seeds here in case you need more convincing! 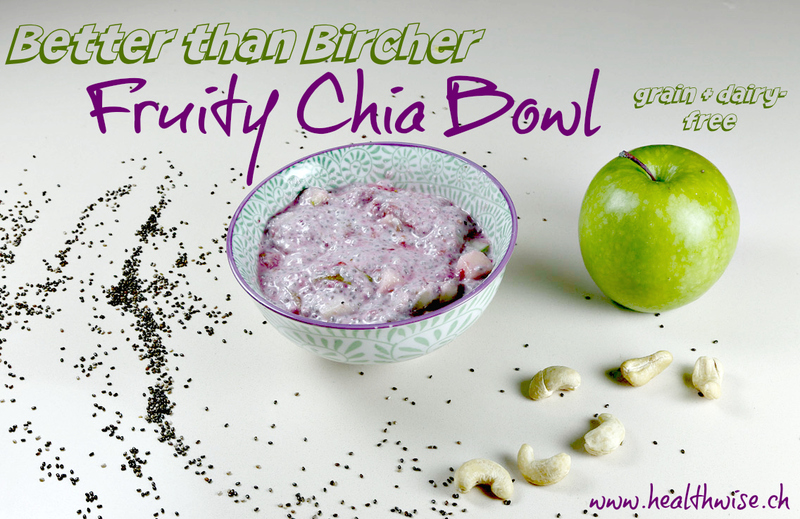 This Fruity Chia Bowl is super easy to prepare, taking only a few minutes in the evening and can be eaten for up to 4-5 days. There is something I find very gratifying about food that is waiting for you in the fridge: I see it as a love note from me to me or my husband. So here’s how to prepare your own love note to yourself and your family. The recipe is very versatile, so feel free to adapt it to suit your needs or just keep things interesting! 1 cup/175 grams raw, unsalted cashews – preferably soaked for 3-4 hours to make them more digestible and easier to blend. Rinse well before using. Spice of your choice – a little vanilla or cinnamon powder work well. I usually don’t add spices during preparation and add some to my bowl instead so I can change the taste a little every day. Chop fruit into the size you like and place in a big container that has a lid. Place the frozen raspberries in there as well. Pour the lemon juice over the fruit and stir. The lemon juice is very important as it helps keep the fruit fresh and lends a sour, almost yoghurt-like taste. Drain and rinse soaked cashew and put them in a blender with the water. You have just made cashew milk! If you want a sweeter taste, you can add a little maple syrup, honey or dates to this mixture although I find it doesn’t need additional sweetness thanks to the fruit. If you are adding spices you can also add them in at this point. Once you have made your cashew milk, add the chia seeds. Pulse very briefly on the lowest setting of your blender – just enough to mix the chia seeds without actually blending them. Pour the milky mixture over the fruits and stir. If you want an even closer experience to the original Bircher, you could add quinoa or buckwheat flakes and stir again. I don’t personally find this is necessary and prefer the taste and texture without. Cover the container and place in the fridge for at least 2 hours to allow the chia seeds to create a jelly-like texture. You can keep your Fruity Chia Bowl in the fridge for about 4-5 days, so you have breakfast ready for almost the whole week! For the best taste, take your Fruity Chia out of the fridge at least 10 minutes before eating. You can now find chia seeds in any organic store. I usually order them online here as they are cheaper to buy in bigger sizes. You can use code WIV403 to get up to $10 off your first order. Are you a fan of Bircher müesli? Let me know what you think if you give this alternative a try! As mentioned in a previous post, I try to avoid bread and bread-like products as much as possible. Not only because white flour is void of nutrients and spikes blood sugar levels, which is what makes us fat, but also because conventionally bought bread has a lot of yucky stuff in it like preservatives. Seriously, check the ingredients next time you’re in a supermarket – it’s actually quite shocking! 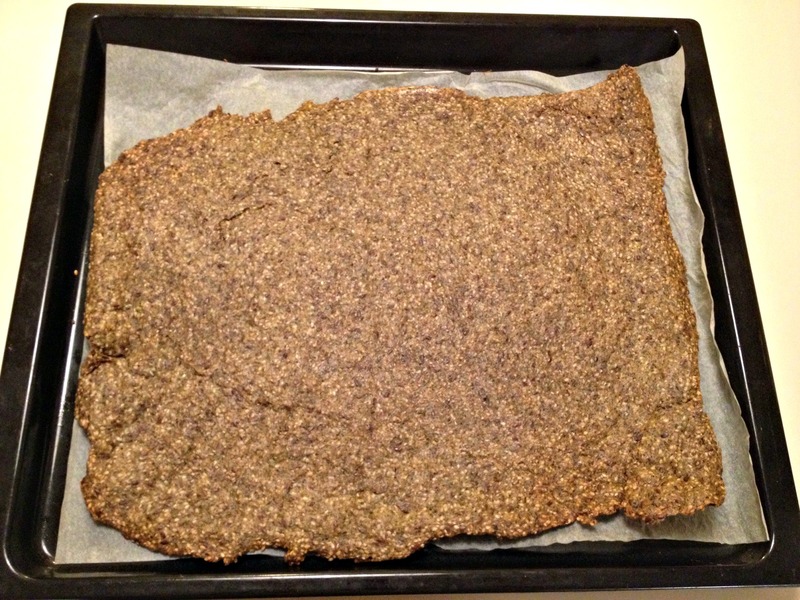 So in an attempt to find a bread alternative and use up 4 cups of cooked brown rice that I miscalculated after having my family over for lunch and slightly overestimating their appetite for brown rice, I had this idea: Make a healthier cracker using brown rice and seeds, loosely based on this recipe. I added zaatar, a herb mix frequently used in the Arab world but you could add pretty much any herb or spice, or even onion and garlic powder or olives. Otherwise, you should be able to find zaatar mix in Middle Eastern stores and often in Fair Trade type stores as well. I have included the recipe in the photo below if you want to make your own mix! 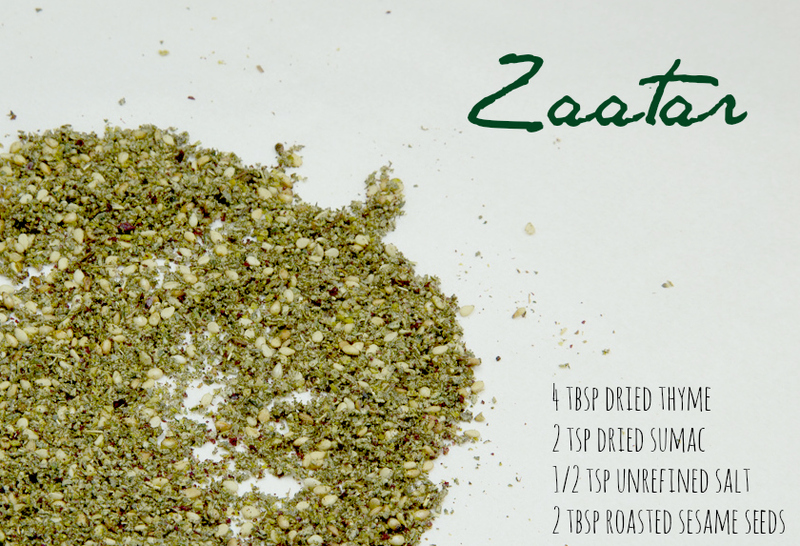 Herbs or spices – I used zaatar which was a match made in heaven. Put rice in food processor and pulse until it is mushy. Add all the other ingredients and continue to pulse until a dough-like consistency is formed. Place the dough on a parchment paper, then take another piece of parchment paper and a rolling pin and flatten the dough as much as possible. The flatter the dough, the crunchier the crackers will be. Bake in the oven at 180 degrees for about 30-45 minutes. Turn them over at the 30 minute mark – you should be able to do this with the whole block. Once they are as crisp and golden as you would like them to be, take them out and leave them to cool. Once they have cooled, you can break them into pieces. Store in an airtight container for up to 1 week. If you think about it, the role bread or dough plays is more of a supporting role than a starring role. A sandwich is more about the filling than the bread and pizza dough is more a carrier than anything else. In my attempt to recreate this supporting role of carrier, I came up with this recipe, inspired by the Italian farinata and French socca, but simplified to only 2 ingredients: Water and chickpea flour. 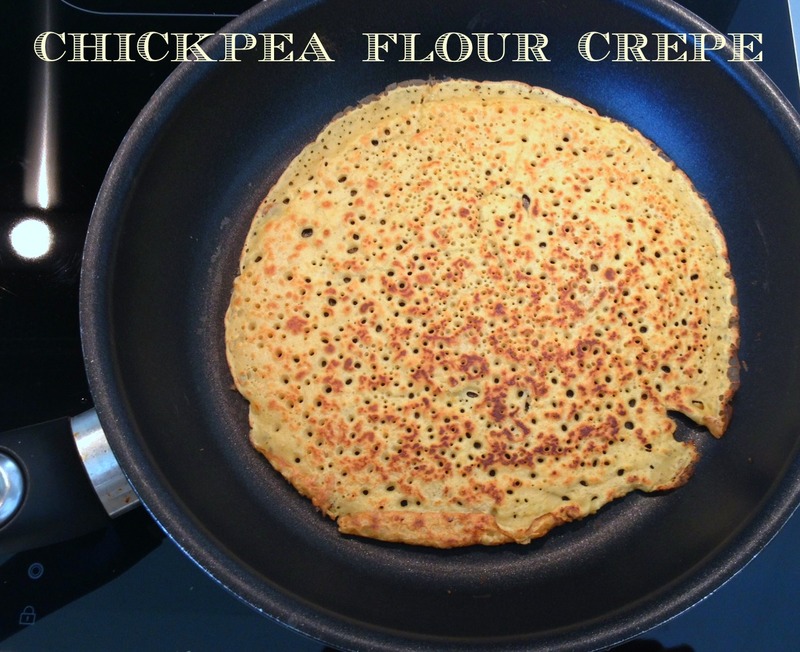 Chickpea flour is just ground chickpeas and can be found in Indian speciality stores or organic stores, usually in the gluten-free flour section. I usually make these crepes as a way of jazzing up leftovers – here I had some tomato, mozzarella and basil salad, sweet potato, chickpea and Feta stir-fry and some homemade sauerkraut that needed finishing! A dash of unrefined salt and herbs or spices if desired. I find that ground cumin goes very well. Mix everything in a bowl and leave to rest for at least 30 minutes. 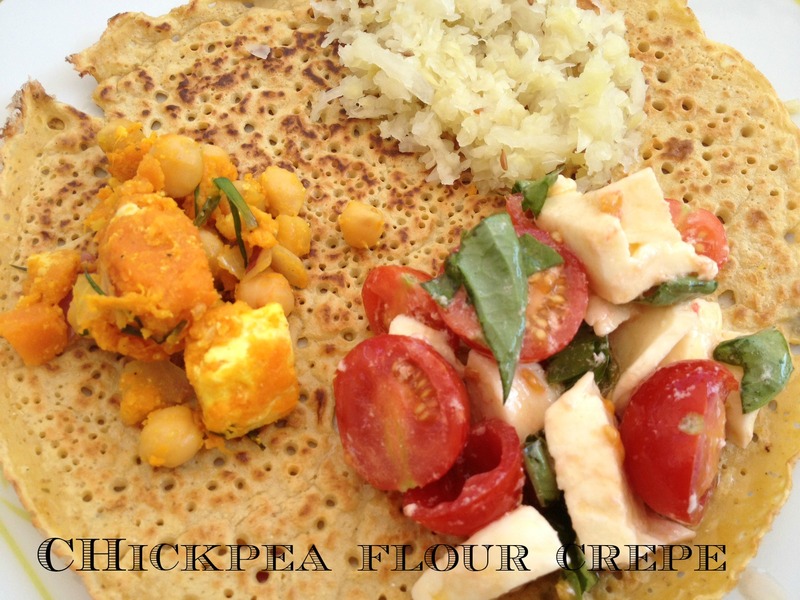 This makes the chickpea flour easier to digest. Heat a little coconut oil in a frying pan and add some batter. Flip the crepe when the side is cooked. Serve with any filling or topping – works particularly well for leftovers! You can also fold the crepe in half to make it more sandwich-like. Shake up your eating habits! Do you find yourself on automatic pilot when grocery shopping, buying more or less the same foods every time? Do you always have the same ‘staples’ at home, things like bread, milk, bananas, tomatoes all year round? When was the last time you ordered something new at a restaurant? Do you have more or less the same breakfast every day of the week? I am not saying you are lazy. On the contrary: As humans living in the modern world, we need to make hundreds of choices in a single day – from what to wear to where to park. It is completely normal that our minds go on ‘automatic pilot’ rather than actively making a decision for every little thing we do – this is what makes activities such as driving possible – we no longer need to think about every little step involved. Sometimes though, shaking ourselves out of automatic pilot can be very enriching. It can allow us to see what we do with different eyes or to simply try something new. 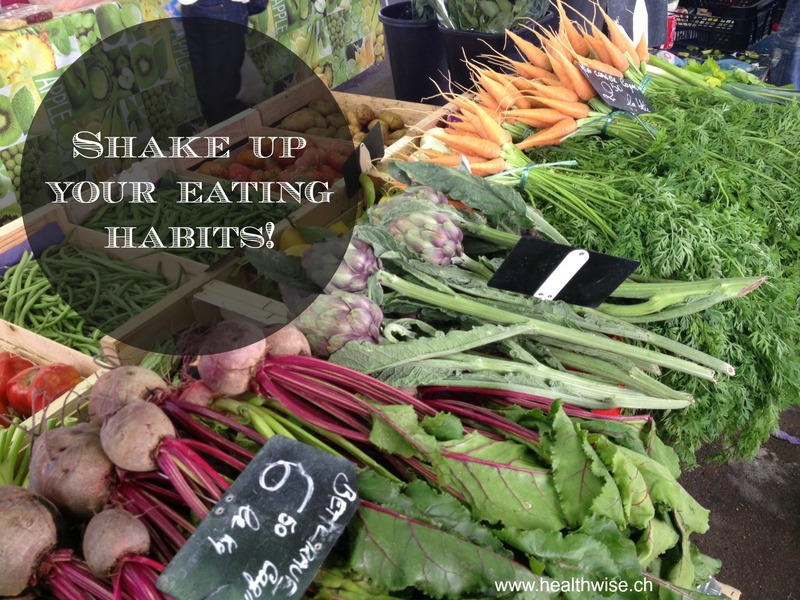 Here are some ideas to help shake up your eating habits! ♦ Vary your grains – try a whole grain that is new to you such as quinoa, millet, buckwheat or brown rice. ♦ Buy a new vegetable you’ve never used before next time you are grocery shopping then google to find a recipe for it. ♦ Do NOT buy your staples next time you are shopping – restrictions can make you more creative, forcing you to find alternatives. ♦ Buy a different brand of your favorite food. ♦ If you always go to the same restaurant, try a new kind of cuisine you have never tried, like Ethiopian food. ♦ Buy something that is in season right now in a big quantity and then figure out what you want to do with it. For example, I bought a large quantity of zucchini which is currently in season and made zucchini muffins, a vegetable stir fry with buckwheat noodles, a tomato sauce with zucchini and added it to a lentil salad. ♦ Buy a type of herb and put it in a glass of water when you get home then add it to everything you make over the next few days. You can even add herbs like mint to water to jazz it up a little. 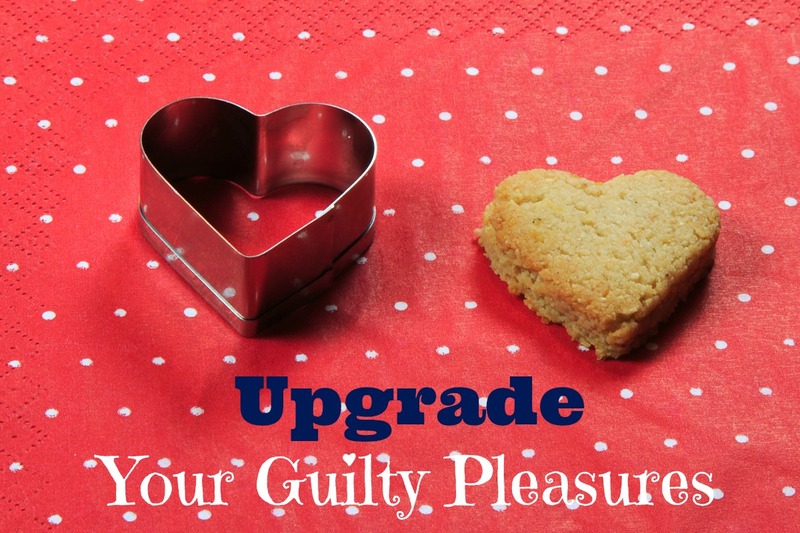 What about you, do your eating habits need to be shaken up? Which of these action points are you willing to try over the next week? I would love to hear from you in the comments below! Do you think these foods are healthy? Rice crackers are touted as a healthy ‘diet’ food but the reality is that they are not filling at all, so it is easy to eat too many of them. They also rapidly spike insulin levels, which can lead to overeating, weight gain and chronic disease. 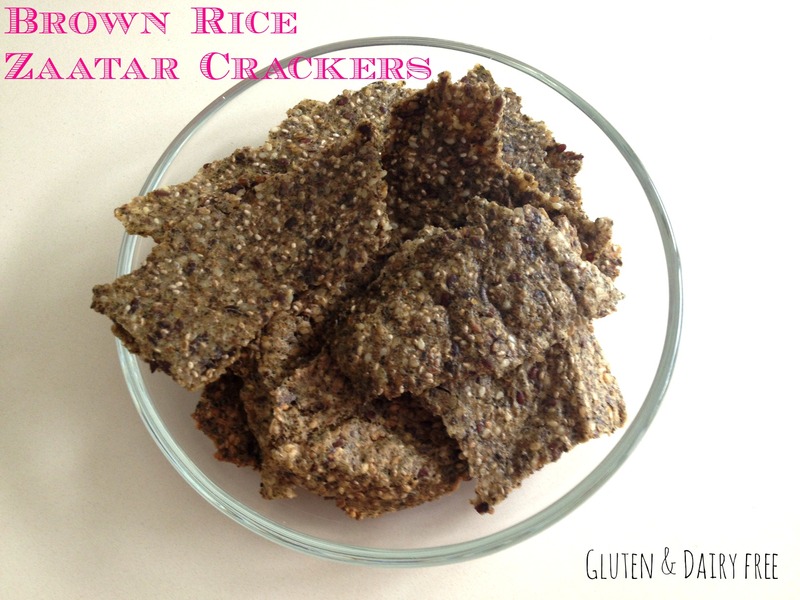 100% brown rice or quinoa crackers without any added sugar or salt. A handful of nuts and/or seeds as a snack. I am not saying to never drink fresh fruit juice, but without the fiber that is naturally present in the whole fruit, fruit juices spikes blood sugar levels considerably. According to Dr Weil, there is little difference in the way the body processes a glass of filtered, pasteurized apple juice and a glass of soda! Margarine is still sometimes seen as a ‘healthier’ substitute to butter but it is a man-made product that is a very unhealthy fat source. Butter – it is a natural food which contains vitamins A, E, D and K. Try to buy organic, unpasteurized butter – or at least butter from cows who ate grass as this really does make a difference in the health benefits. Read more about the health benefits of butter vs. margarine here. 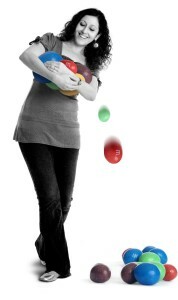 When the fat is removed or reduced, gums, sugars and starches are usually added to improve the taste. The original, full-fat version, even if this means eating a little less. This shouldn’t be difficult as full fat products are more satisfying anyway. Fruit yoghurt or yoghurt drinks or shots often contain artificial coloring, a high quantity of sugar or artificial sweeteners and thickeners like gelatin, corn starch, milk protein concentrate. Natural, full-fat plain yoghurt without added sugars or artificial sweeteners. You can always add in your own fruit or a little honey or maple syrup if you want. Are there any major surprises for you here? What other foods would you label as less healthy than you would think? Meet my nut butter family – from left to right: Peanut butter, sesame butter, almond butter, tahini and cashew butter. I use these in many different ways as they are a tasty way to add healthy fats and protein into the diet. They are also very filling, so a little goes a long way! Most commonly, I spread a nut butter over crackers, pancakes vegetable sticks or apple slices. I find nut butters healthier alternatives to jams or other spreads. I sometimes add sesame butter to a dressing of olive oil and lemon which I use over vegetables or salads. On days when I want to add a little more protein to a smoothie, I add a spoonful of almond or peanut butter. 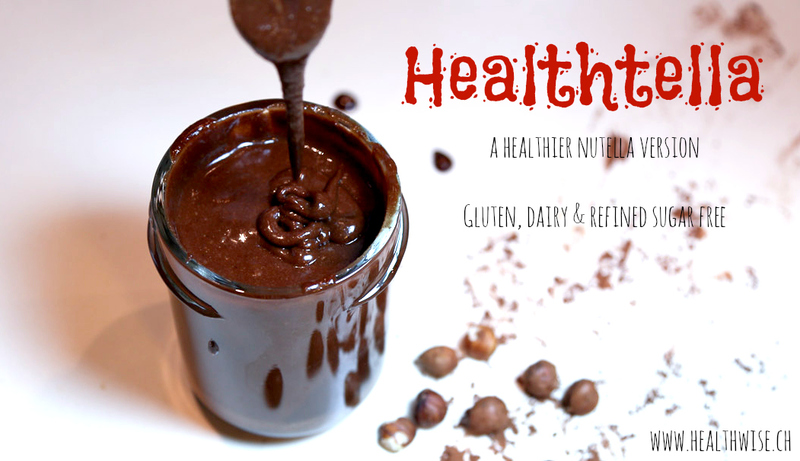 I find that peanut butter goes well particularly with cacao or carob flavored smoothies. Many raw food desserts use nut butters as an ingredient – particularly cashew butter as it has a light yet very creamy texture. I also find that almond butter goes extremely well with apple or apricot pies. Like most healthier alternatives, the less ingredients, the better! In this case, only look for one ingredient – the nut, without added salt, sugar or oils. The difference between sesame butter and tahini is that the seeds in the sesame spread are unhulled (whole) and so contain more nutrients and taste, while tahini uses sesame seeds with the outer layer removed, giving it a lighter color. I use tahini to make spreads such as humus and baba ghanoush and also combine it with a little olive oil, lemon and garlic to make a sauce that goes well with Arabic food, particularly falafel. An easy upgrade which is very worthwhile is replacing refined table salt with unrefined salt, either sea salt or Himalayan salt. The white, refined salt most commonly used these days is stripped of any minerals and is actually toxic to our bodies, leading to inflammation of the tissues, water retention and high blood pressure. Unrefined salt is more grey or pink and contains electrolytes, which help maintain the water balance in the body as well as nerve and muscle function. Because it is not processed, unrefined salt still contains minerals which are very beneficial to the body – boosting the immune system and helping with headaches, thyroid health and even with cholesterol levels and high blood pressure. Salt has gotten some bad press recently, but like many other instances in nutrition, the QUALITY of what is used is the most essential ingredient. After all, our bodies need salt to help maintain balance since salt is the second most common substance in the human body, (after water). Meet my coconut family. A year ago, I didn’t use any coconut related foods regularly. Now coconut oil, coconut flour, coconut milk, coconut sugar, grated coconut and coconut flakes have all become a staple of my diet. My coconut family – only thing missing is coconut water which is more hydrating than water and a better source of potassium than bananas! You can learn more about the many health benefits of coconut here – I mainly use it because it is often a good alternative to other foods and I love the taste! Extra Virgin Coconut Oil: It is vital to buy a good quality, extra virgin oil. I use this mostly for cooking as it has the highest smoke point of any oil but I also like to spread it on crackers or bread like butter. Coconut flour: I just bought this to try it out as an alternative to gluten and cereal flours. It is very popular with people following the Paleo Diet, a diet based on how our ancestors ate before the agricultural age. I just made coconut bread using this recipe and to be honest, I am not sure I will buy it again! It tastes a lot drier than other flours, but has a lovely smell when you open the pack. Coconut milk: At the moment I am trying to reduce my dairy consumption, so I have been using coconut milk instead of yoghurt or cream in curries and soups, but also occasionally adding a little to morning smoothies. It gives a nice creamy consistency to food. 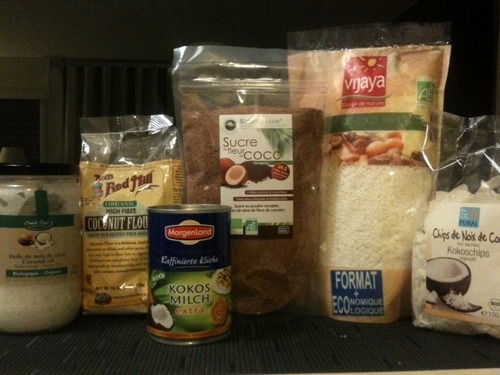 Coconut sugar: I found this today in my organic food store for the first time and am very excited to try it! It can be used in the same way as brown sugar, but is supposed to be a healthier alternative. 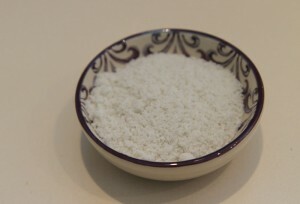 Grated coconut: I use this mostly in cookies and cakes to add bulk, taste and moisture. Coconut flakes: I love adding these to my morning porridge, oatmeal or smoothie. They can also be roasted for an even more special taste. My favorite combinations: I find coconut especially divine with raspberry and cacao. Despite appearances, I am actually quite moderate in my consumption of coconut foods as I think it is important to not overuse too much of any one food or ingredient, no matter how healthy! 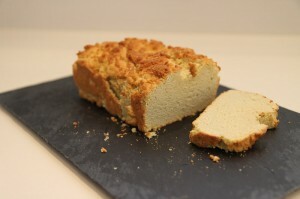 Coconut bread – a little dry but extremely filling! Since I started eating more healthy, I slowly changed my chocolate consumption from milk chocolate to 70% dark chocolate up until 100% dark chocolate (not for the faint-hearted!). 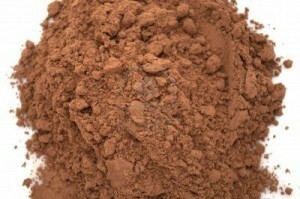 These days, I am experimenting more with raw cacao. When cacao is used unsweetened and unprocessed, it has one of the highest antioxidant levels of any food and is also a good source of magnesium, iron, zinc and more. Cacao is actually recommended to fight depression as it contains tryptophan, a precursor to serotonin, the happiness neurotransmitter and it also has positive effects on cardiovascular health. I decided to take my new food processor for a test run by making date, walnut & raw cacao fudge, loosely based on this recipe. I added cinnamon to the mix and coated my balls with sesame seeds for some added pizzaz. In total this took me about 10 minutes and the result is absolutely delicious! If you want to know more about cacao, no doubt Raw Food guru, David Wolfe has to be the most passionate person on this earth about this wonderful ingredient – you can watch him here. Like quinoa or amaranth, chia seeds are originally from Central and South America and actually come from the same family as both sage and mint! With 20% protein, 25% dietary fiber and about 35% healthy fats, mostly Omega 3, chia seeds are a great addition to any diet. They are also a good sources of iron, calcium and other vitamins and minerals. Like flaxseeds, chia seeds are one of the few plant-based sources of omega 3. Unlike flaxseeds, however, they do not need to be ground to be beneficial and can be kept for years and heated without going rancid or losing their nutritional benefits. This versatile food can be used as more than just a seed due to its jelly like consistency when water is added. Here are a few ideas. Because they have virtually no taste, they can be sprinkled over pretty much anything to boost the nutrition and fiber content without changing the flavor. I find this works especially well for breakfast foods – added to cereal, porridge or oatmeal but can also be used on savory dishes like soups, salads or pasta. Cakes, cookies, breads, crackers or bars can be made more nutritious by adding chia seeds into the batter or by using them as a topping. They can also be added to smoothies. They can also be used as an egg substitute in baking by combining 1 teaspoon of ground chia seeds with 1/4 cup water per egg. You can also make chia gel, a jelly like substance that can add consistency to soups, sauces or puddings by combining 1 part chia seeds with 2 parts warm water. This can be stored in the fridge and used when needed.